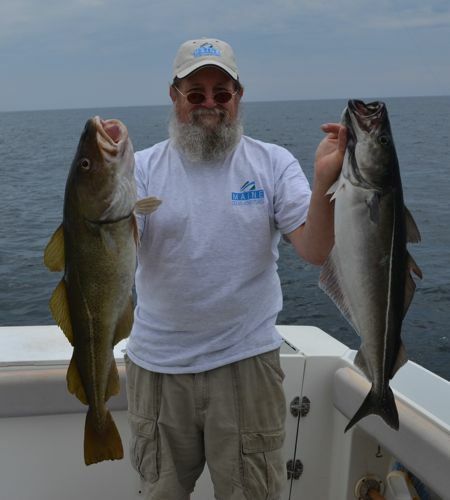 2014 looks like it will be another GREAT year to be deep sea fishing in Maine. We start the season on May 1st and run into October. We will be entered in several tournaments again this year and we do take charters during these tournaments for those of you that are interested. For those of you that would like to go on a charter boat but do not have enough people to join you or you want to make new friends, we do take names and when we have 5 or 6 people we make the arrangements to set you up for a trip. We mention this because we are asked if we do it. For those of you that are veterans, there is a “FREE” tournament in July that you may want to look into. It is called the Maine Veteran’s Appreciation Tournament and all you need to do is sign up and you may get to go out fishing for free!!! Space is limited so you will need to sign up quickly when they start taking applications. Go to their website and you will find all the info you need to find out when you can sign up and the details of the event. It is a great time and it is one way we show our appreciation for all that you have done for this Country. For all our repeat customers we need to mention that we have moved to a different location (marina) and we know you will like it! We are also going to have a booth at the Maine Sportsman Show that takes place in Augusta, Maine from March 29 – 30. We will be offering a show only discount so we hope to see you there. 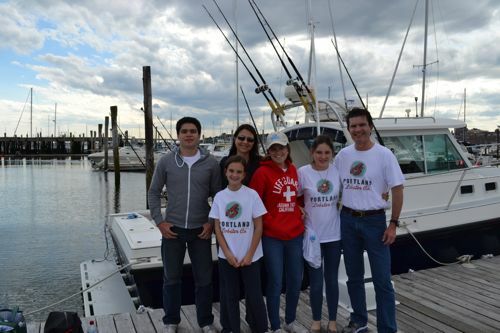 We look forward to a GREAT 2014 deep sea fishing season and hope to have you aboard with us. Talk with you soon. 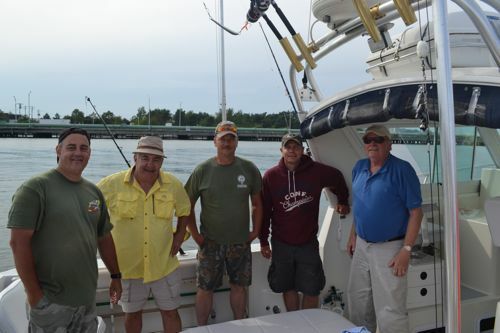 We had a great day of deep sea fishing with this group to the right from the Veteran’s Appreciation Tournament. You can learn more about this event that celebrates our Veteran’s by going to VetsAft.com. 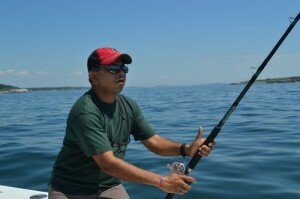 The fishing was off but they did manage to all catch fish and have a great day on the water. Many of the local charter boats provided their services at no charge for this day and we will do it every year as long as the tournament is held. We had a day to remember and so did the veterans! 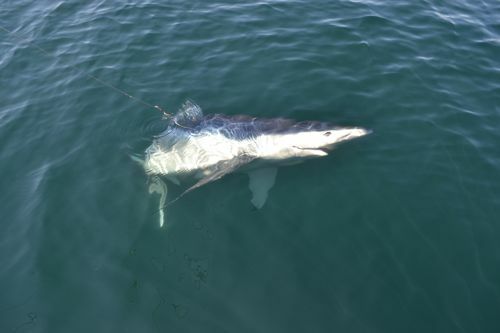 The 9 foot blue shark they caught really got them wound up and they can now say that they caught a fish bigger than them!!! We did manage to tag this shark as part of our Apex Predator Tagging Program and the vet’s were amazed at just how far these fish can swim. We look forward to next year so we can spend another day with the veterans deep sea fishing in Maine. They all hope to be back with us again at Maine Ocean Adventures so that they can battle with some more shark! 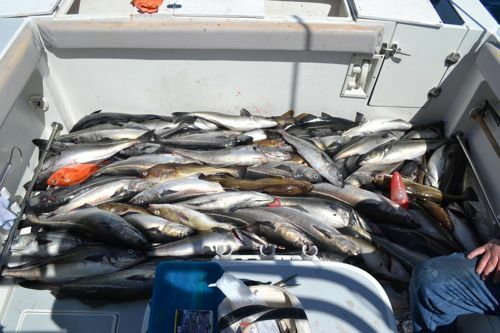 We have been very busy with offshore deep sea fishing trips lately and this Bachelor party had a great day on the water catching groundfish and blue shark. Ken Moulton made sure his brother the GROOM had a day to remember fighting a monster blue shark and took the photos to prove it. The groundfishing was a little slow as it always is on a day where the water is flat calm but this group kept at it and brought home plenty of fresh cod, cusk, haddock and pollock filets. It is always interesting to hear the comments that are made when the first shark of the day arrives! Most of the comments are not for print but the excitement that a shark creates lasts a lifetime and it was no different for this group. This ten foot monster gave the GROOM all he could handle and then some! He can now say that he caught a fish that was bigger than him!!! They wanted to catch lots of fish and shark on this day and the mission was accomplished. 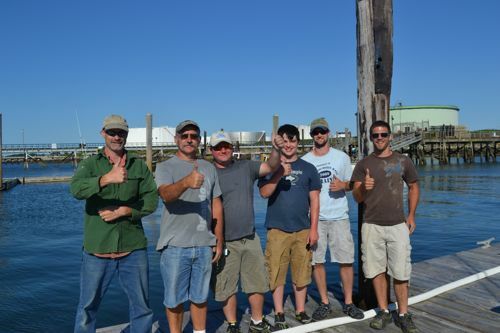 We asked this group from the Shapleigh, Maine area back at the dock if they enjoyed a great day of deep sea fishing in Maine with Maine Ocean Adventures and it was all thumbs up! Another great day on the water with terrific sportsmen having fun. 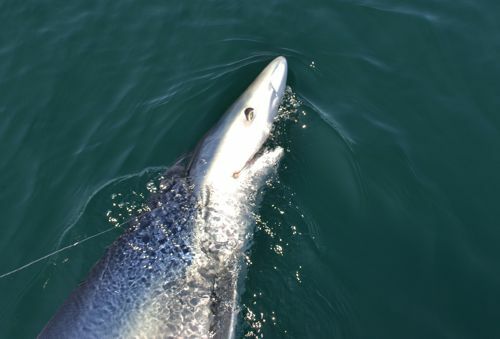 The photo below is a close-up of a Monster Blue Shark that was caught, tagged (Apex Predator Tagging Program) and then released alive on this trip. 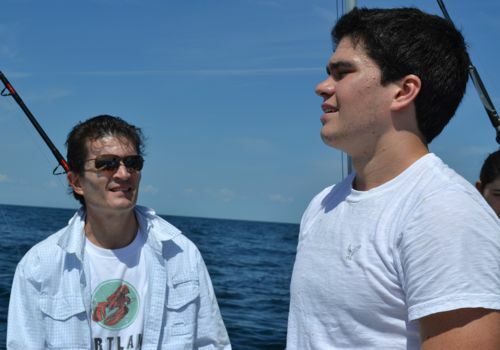 Deep sea fishing in Maine is one of the coolest trips you can take during your summer vacation in Maine. 1. So, what is Deep Sea Fishing exactly? 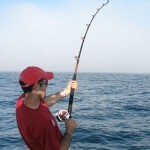 Deep sea fishing, otherwise known as offshore fishing is when you take a charter boat out to deep water in the ocean. In order for it to be considered deep sea fishing it usually needs to be about 30 meters in depth. 2. What Types of Fish will we catch? 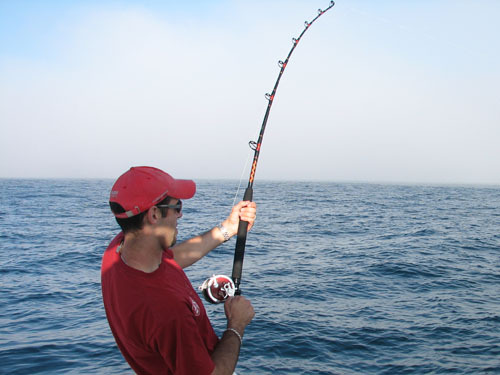 Going offshore fishing allows you to catch bigger game fish. 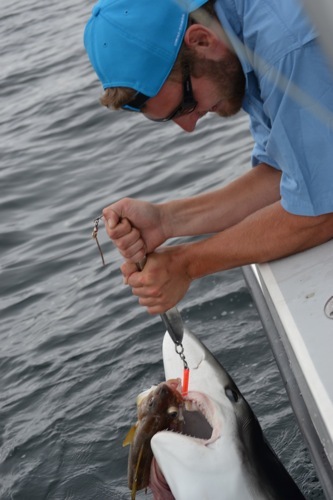 Catching shark, cod, pollack, haddock, halibut and more, this isn’t just your average catch on a Maine lake. These guys are big and the catch can be exhilarating. 3. Do you need a Maine Saltwater Fishing license? The quick answer is no. As a charter boat we have a license that covers you while you are on board. 4. What should I bring with me on the Trip? 5. Are there any tips to ensure we catch a fish? This time of year the fishing is great. As an experienced Captain I have a few tricks up my sleeve. Summer is here and in Maine we are having a great year. The water is warmer and the bigger fish have started migrating up. We’ve seen whales, sharks and more. Every trip has been a success lately. With almost every line coming out of the water with a fish on it. Here are ten offshore fishing tips from the pros to check out before we leave the dock. Have a question? Ask us here in the comments section and we’d be happy to help you get ready for your next adventure!! Headed to Maine for a family vacation? Looking for an Adventure? 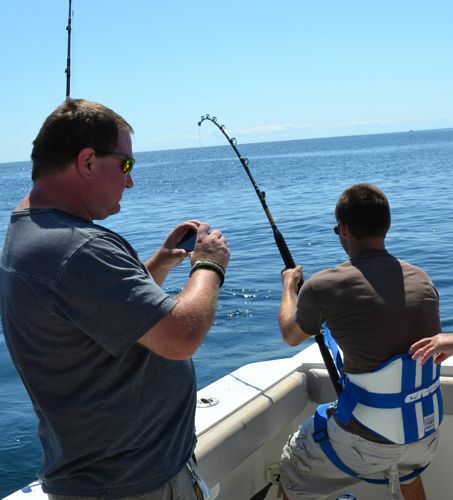 Add Maine deep sea fishing to your itinerary! Summer is an amazing time in Maine, not only is the weather beautiful and the scenery awe inspiring but the fish are biting! Maine offers many things to do, offering you photo opportunities and memories to last a lifetime around every corner. However, you don’t want that memory to include freezing to death, becoming sea sick or looking like a lobster because you got burnt to a crisp, but rather of your family enjoying catching lots of fish while deep sea fishing in Maine. The best way to ensure that your family vacation in Maine is a safe and fun one is to make sure you plan ahead. When you go deep sea fishing in Maine you need to make sure that when you board the boat you come prepared. Sunblock – Even though it can feel cool out on the water the sun is still blazing and the reflection off the Maine Ocean doesn’t help. Make sure to bring plenty of sun protection with you to be safe. Motion Sickness Medicine – Many folks take non drowsy Dramamine and some use the pressure bands, if you find that you are getting motion sick make sure you look at the horizon. Warm clothing – Dress in layers. Maine weather can change very quickly it’s important to be prepared while out in the ocean. A good attitude and a smile! You are about to have a lot of fun! Feel free to print this post and use as a guide while you are packing for your next trip! 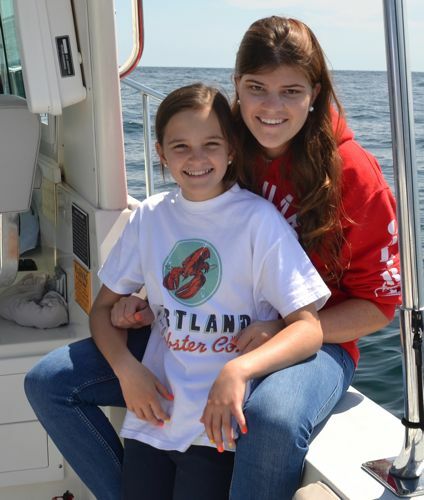 What a GREAT day deep sea fishing in Maine we had! We saw whale, tuna, blue shark and a “ton” of groundfish that we caught, many of which we released to be caught another day. 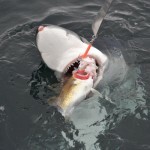 Deep sea fishing in Maine at it’s best all day long. The fishermen that we had aboard today go often with us each year so they are no strangers to going offshore deep sea fishing with us. They actually pitch right in with the filet operation which is always appreciated very much. 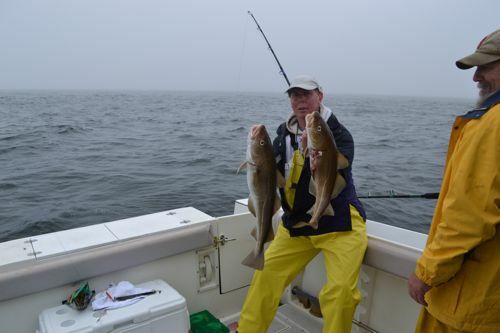 The picture to the right is of Earle “The fishin’ machine” with a double keeper catch of a 12 pound cod and an 11 pound pollock caught on the same rod at the same time. The pollock had a few shark teeth marks on it! We found the fishing a bit slow to begin the day and then it really picked up after 10 AM. The secret today was to use bait and to fish a little deeper water. 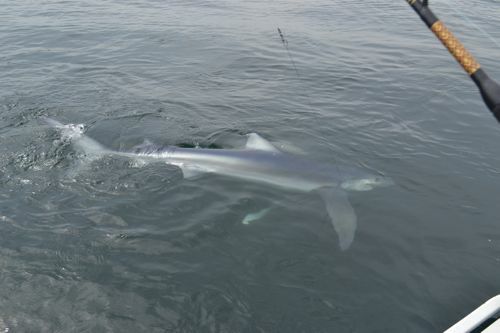 We also had a blue shark take one of our tuna baits today and that provided for some extra fun and excitement! The picture to the left is of Rich at the filet station. We like to filet our fish soon after being caught to keep the catch fresh. 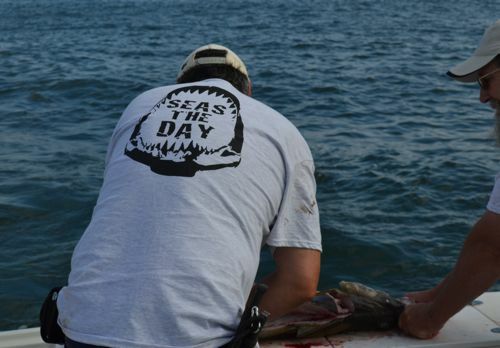 You may notice the shark jaw and “Seas The Day” motto on the t-shirt that he is wearing. This is on a t-shirt that we now offer for sale along with a cap that has the Maine Ocean Adventure logo on it. Earle “The Fishin’ Machine” has both cap and t-shirt on in his picture. On each trip we provide a cap or “t” to one of the passengers that stood out among the rest that day. It could be for being the best or the most challenged person on that particular Maine deep sea fishing trip! Sometimes the loser wins! 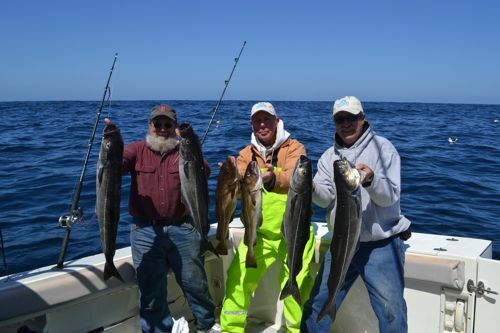 We have lots of Maine deep sea fishing trips coming up so you can see more on what you are missing right here on the Adventure updates page. Or, you could call us today to book your deep sea fishing trip in Maine and have the next update be all about you! This summer has been very busy with Casco Bay Cruises and Maine deep sea fishing trips day after day. One of the best things about running a charter boat is getting to meet and becoming friends with people from all over the world. 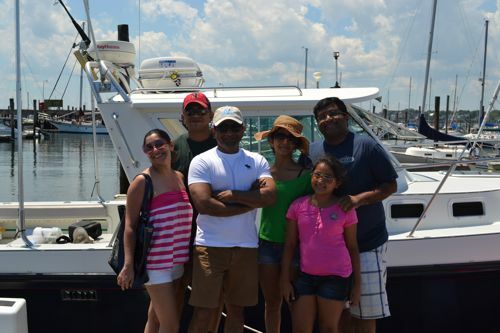 We had the opportunity to meet the Menon family and their friends on a recent trip and they were visiting from Bombay India! 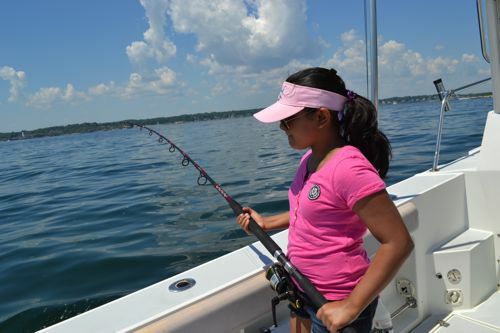 They wanted to take a cruise of Casco Bay and try their luck at catching a fish. Well, the youngest of the group wanted to try to catch a fish and she was successful in doing so within the first 5 minutes. You would have thought they had won the lottery the way they went on about catching mackerel! This family and friends had a great time taking in the sights and asking a lot of questions about Maine, Portland, Casco Bay, wildlife, deep sea fishing and you name it they asked about it!!! They were very curious about the way of life here in Maine and the U.S. The part of India that they are from is on the Arabian Sea and is now called Mumbai instead of Bombay and it has a population of 20.5 million people. The daughter is a chemistry student at Northeastern University and they come here often to visit. They plan on coming back out with us for some offshore deep sea fishing later in the summer. We hope you all had a safe and happy 4th of July! Catch you next time! 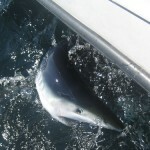 If you have ever wanted to try deep sea fishing in Maine there is no better time than now! The fishing for cod, haddock, pollock, halibut and many more gets no better than it is this time of year. Plus you never know when you might hook into much larger species like shark or tuna!!! Imagine going from catching groundfish ranging in size that you measure in inches to catching monster fish that you measure in size by number of feet!!! And, hundreds of pounds!!! It happens often this time of year and on every trip it could be happening to YOU! So if you have been waiting for that particular time to have a great day deep sea fishing in Maine, you need wait no longer. Call us today so that you can book your trip of a lifetime and maybe what happened in the photos below will happen to you!!! Huge Shark Takes The Bait !!! Or should we say our cod!!! 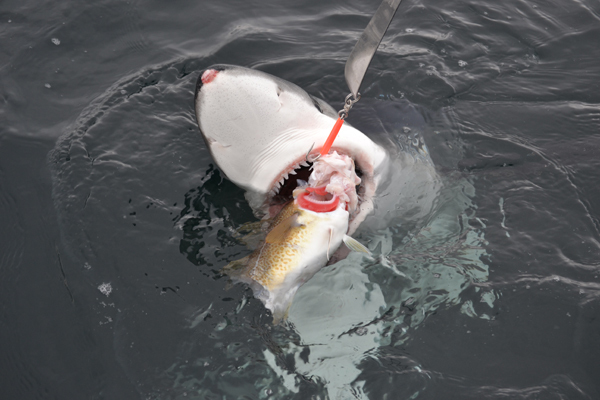 You see, you just never know what might happen next on a Maine Deep Sea Fishing Trip with Maine Ocean Adventures. We put you on the fish on EVERY trip or the next trip is FREE! 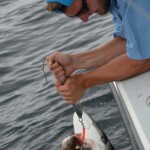 That is correct, we guarantee that you will catch fish on all of our deep sea fishing trips or your next trip is on us! So call us today so that you can catch your fish or know that someone else is going to be catching your fish. 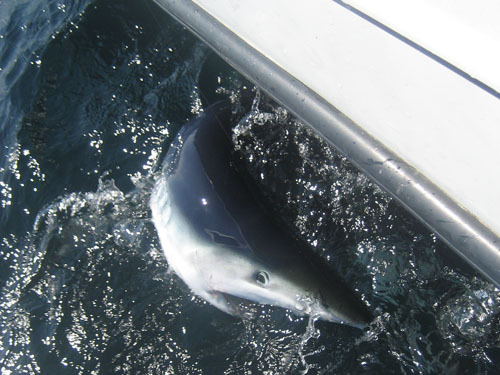 Deep sea fishing in Maine gets no better than with Maine Ocean Adventures.